Nice card in EX-MT condition and very well centered! See scans. Died in 2000. Card and autograph are in NEAR MINT condition with minor wear. There are 6 cards in the scans but this sale is only for the card in themiddle row - middle card. Stamp(s) will be placed inside a plastic bag for protection. Each card will be placed in a soft inner sleeve within a Top Loader. Item Not As Described. DURING HIS CAREER HE HAD 9 PRO BOWL SELECTIONS, 4 FIRST TEAM ALL-PRO SELECTIONS, 5X FIELD GOAL LEADER, AND WAS A 4X NFL CHAMPION. HIS NUMBER 76 IS RETIRED BY THE BROWNS. CENTERING IS FAIRLY GOOD WITH MINOR MARGIN DISTORTION ON THE LOWER EDGE. Died in 2000. Card and autograph are in NEAR MINT condition with minor wear. There are 6 cards in the scans but this sale is only for the card in thetop row - right card. 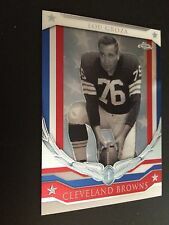 1952 BOWMAN SMALL LOU GROZA PSA 4 VG-EX BROWNS #105 CREASE/WRINKLE FREE! Item pictured is the exact one you will receive. FLEMINGTON, NJ 08822. The grade we have assigned to each card in the heading is strictly our opinion. Card is in vg-ex condition with a clean front and back, is creased and a bit worn corners. Card is in vg-ex condition with a clean front and back, is creased and descent corners. Trying to complete your set?. Let us help you! Collect a favorite team or player?. You can also find cards of players in your favorite NCAA uniform by searching our college team categories. We are adding hundreds of cards to our inventory every week. Nothing to hide on this card a solid example. Card is in Vg-Ex condition with a little wax, is creased and descent corners. 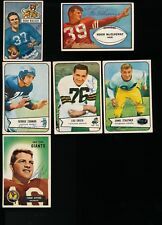 1959 Topps Football #60 Lou Groza NM-MT. Payment: PayPal Shipping: USPS First Class Package for items under 1lb. Items over 1lb will be shipped via USPS Priority Mail. We will combine shipping on multiple orders. Returns: Returns are accepted within 14 days and the item must be returned in its original condition. Feedback: We strive for 5 star feedback. If you cannot leave positive feedback please send a message and we will fix the issue. Thank you! It has never been taken to shows or handled by others. 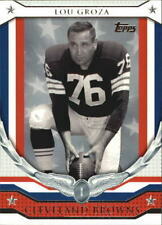 RARE - 1990 SWELL GREATS LOU GROZA SIGNED ON CARD AUTO #86. GRADED: SGC Authentic. 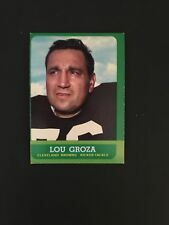 THIS IS A 1955 BOWMAN #37 LOU GROZA FOOTBALL CARD (EX NM). THE CARD IS IN BEAUTIFUL SHAPE, ABOUT AN "EX /NM" IN CONDITION. A BEAUTIFUL PIECE TO HELP COMPLETE A SET OR JUST FOR COLLECTING FUN! HONESTY IS OUR PRIORITY! Card is in nm-mt condition with a clean front and back, no creases/wrinkles and descent corners. 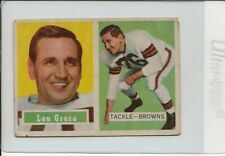 Lou Groza / Cleveland Browns. Magic the Gathering. Hot Wheels, Matchbox & Johnny Lightning. NASCAR Diecast. Sports Cards (All sports). U.S. & World Coins & Currency. Card is very clean.good corners nice centering nice gloss. Ask for Salty, Na Brown, Tad Applegate IV, Hester or Lex. Limited Edition - Issued from the Pro Football HOF. Cleveland Browns. Nr Mt - Mt condition.